I've just returned yesterday for Kuwait City where, together with colleagues from GDNet, I've supported the social reporting at the 2013 ERF Annual Conference. This is the third year I have attended this conference which have always found to be extremely interesting events, in terms of topics discussed and quality of speakers invited. 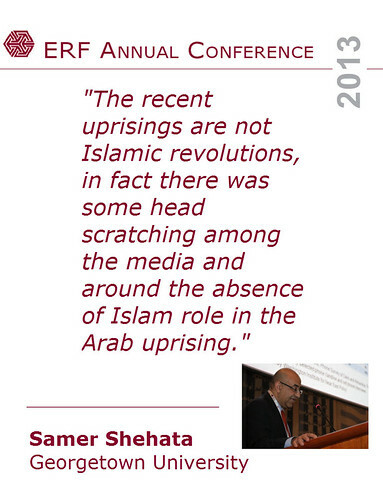 This year event focused on the rise of Islamist parties following the Arab uprising, and what this means for the economic development of the region. The plenary sessions looked at the causes of the Arab uprising and the rise of Islamist parties to power in Tunisia and Egypt; a comparison between these countries in terms of economic development policy since Islamist governments came to power; and finally a look at some future scenarios for the region. With a small team of just three people we had to be selective in terms of what social reporting we could realistically do. We chose the usual suspects but we also tried something new. Even if the crowd was not particularly Twitter-savvy - and unfortunately participants were not provided with Internet access till the third and last day of the conference (no need to comment on this...) - we covered the plenary sessions with live tweets using the hashtag #erf2013 - several tweeps from outside the event re-tweeted and joined in the conversation. We also recorded several short video-blips with most of the speakers at the event. The videos are available on YouTube on this playlist. Most - if not all of them are - are also published on the ERF blog, together with short write-ups of the plenary sessions. Further, we collected all social media outputs into a daily curated summary using Storify - see here the social stories for day one, two and three. Last but definitely not least, we had done a bit of R&D (as in "robbing and duplicating") and got inspired by the multimedia coverage of the recent TED Global 2013 and their TED Quotables. We created a series of images with the most relevant quotes from speakers and participants at the ERF conference. While a bit more time consuming than we'd expected, these images worked well as we were displaying them on the big screen in the plenary room before each sessions started, alternating with pictures form the event. This attracted the attention of the participants who could view them as they were entering to attend the sessions. It was a nice experiment, and I think one I'll repeat in future social reporting of events. Besides blogging, tweeting, blipping, photo-sharing and slide-sharing, what do you use when you do social reporting?